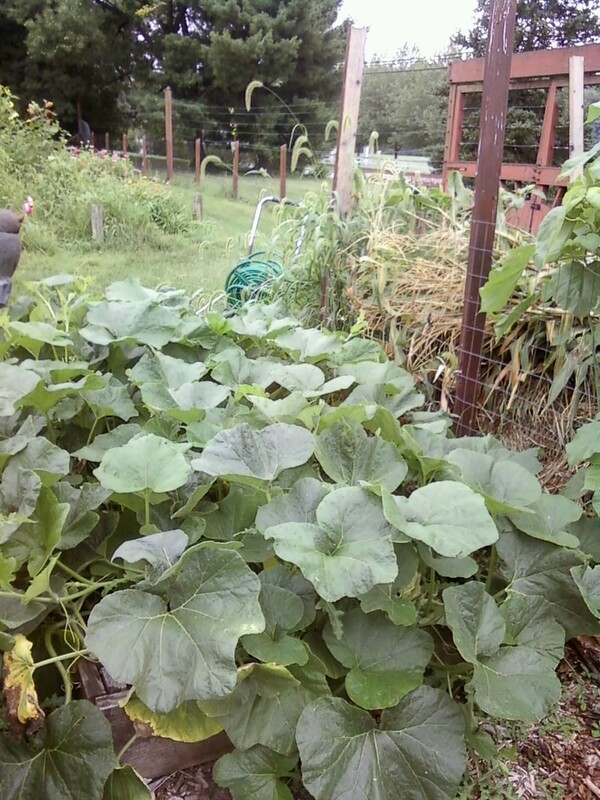 This year, I broadened my horizons a little and tried zucchini, spaghetti squash, and butternut squash in a raised bed. I harvested two spaghetti squash and Amy and I made a delicious dish. First, we cut the squash lengthwise, scooped out the seeds, and baked them face down at 350 degrees for 25 minutes. Then the fun part began when we got to pull the "spaghetti" from the squash. Pulled spaghetti squash... my imperfect food photography skills makes it look like shiny worms, but I swear it was delicious! We try to remember those two beautiful spaghetti squash and zucchini fondly, because they were the only ones we would see all summer. Why, you ask? 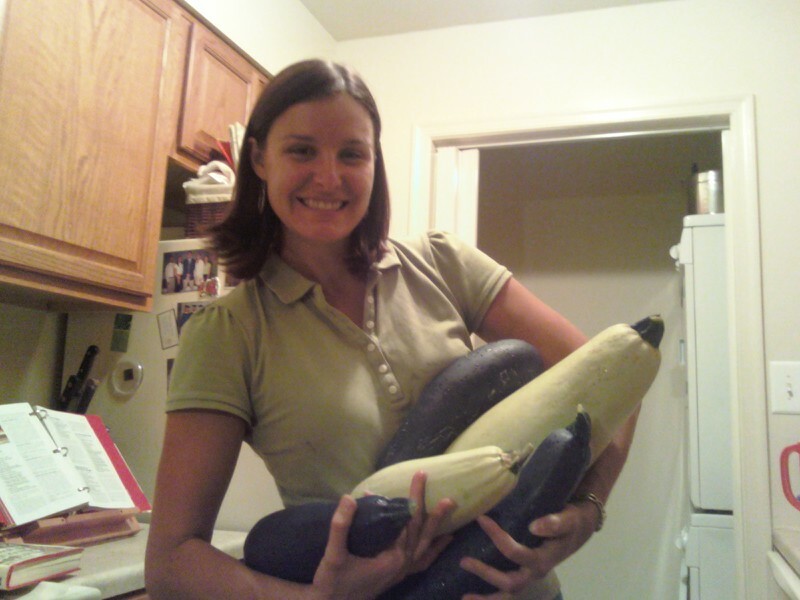 Because apparently butternut squash is the thug of my veggie garden. Since the summer heat kicked in, this plant has grown like a maniac, eating all innocent plants in its way. I feel like it grows a foot each day... good thing I like butternut squash! With so much to handle, we had to get creative with dishes. Butternut squash is roasted just like spaghetti squash... cut lengthwise, scoop out the seeds, and place face down on a greased cookie sheet. It has to be baked longer- 350 degrees for 1 hour- and you need to pierce the skin many times with a fork. After it is done, you scrape it from the skin. So far, we have made two dishes with our lovely squash- Butternut soup and shepherd's pie. For the soup, I used a combination of recipes I found and things I thought I remembered seeing in the past. *cook the onion in olive oil for 2-3 mins, add the apples and water and cover, allowing them to steam (I don't know if this a real cooking technique or not, but I felt like it would work to soften the apples), add the squash and heat for a few minutes until the consistency looks like soup (yea, we are real technical here). Then puree the mixture in a blender, return to the pan, add the milk and you are done! The second thing that we made with the squash was Hungry Girl's Squash-tastic Shepherd's Pie from her book Recipes and Survival Strategies for Guilt-Free Eating in the Real World. Another blogger has posted the recipe here. The only difference was that I used the roasted squash, real garlic instead of garlic powder, and I omitted the onion powder and butter. I have to give it to that Hungry Girl, she has some tasty recipes up her sleeve! Ready to go in the oven... not the orange squash in the blue bowl... yes, the Florida Gator thing really is an obsession! We have lots of roasted squash left, lots more coming on the vine, and a few more recipes up our sleeve, so we will keep you posted!